Discovering that the way to make a business internationally competitive is by the splendid production of knitwear and macramé, primarily recognized for their quality, led Yelka to investigate and revalue excellence as an irreplaceable critical element for the development of mini-businesses associated with this enterprise. Training in technical skills, systems for control, filing and registration, and the organized delegation of responsibilities were some of the initial skills imparted to the women that the mini-businesses are comprised of. However, this change in direction went much further. As the mini-businesses grew, the life stories of the women assigned to the workshops came to light. Many of them came to work with telltale signs of physical abuse, abandonment, sadness, anger and, in some cases, desperation. Yelka, a divorced mother, began to recognize the experiences that motivated these women, ones she also shared: the desire to create better opportunities for their children, with a persistent and unflagging vision, able to bridge borders, age differences and beliefs. So it was in the spirit of inclusion and recognition of these women’s needs that spaces were provided in the workshops which allowed the women to bring their children. The objective of this organization today is the empowerment of women, not only through the limited spaces that value and facilitate their development, but also through the promotion of a positive transformation of leadership and genuine respect for themselves, and from their partners and families. 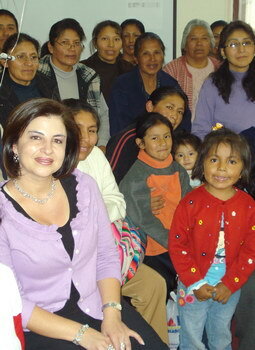 This process of empowerment begins with recruitment, for which the organization has defined an inclusion policy which prioritizes the incorporation of single mothers (due to their higher risk and vulnerability), abandoned and divorced women, single mothers and widows, on whom their families’ economic and emotional well-being completely depends. Another fundamental pillar for the empowerment of women is built through the promotion of new mini-businesses, which in turn are generated from and become independent of existing ones. For this task the craftswomen must demonstrate a strict commitment to the responsibilities assumed in relation to the quality parameters the finished clothing articles must conform to, to the delivery deadlines and to the preservation of the collaborative philosophy that guides the organization today. For its part, Madres & Artesana Tex provides the markets, the manufacturing know-how required, the materials and a basic physical structure so that the mini-business can begin to operate. Madres & Artesanas Tex has begun to appropriate the concept that all over the world hopeful signs are appearing for organizations of manufacturing women. It involves generating a productive and reproductive master pattern, which, with its crossover effect, changes women’s lives for the better. It engenders the recognition of women’s resource-generating capacity, which allows them, with their partners, to improve their negotiating power in all the aspects inherent to their own sexuality; to heighten their self-esteem; and to understand those processes which involve the taking-on of roles similar to child-raising and their concerns for a better future for their children.